These all terrain binoculars are perfect for sportsmen and sportswomen who don't let mother nature get them down. Wilderness binoculars have mulit-coated lenses and BAK4 prisms for bright, sharp images, are nitrogen filled, waterproof, fogproof and rubber armor-coated to keep out the weather. These binoculars are rugged enough to take on your most challenging adventures. Power x Obj. Dia. : 8x25, Field of View: 341 ft. at 1000 yds., Eye relief: 14, Exit Pupil: 3.1mm, Weight: 14.3oz, Height: 4.25"
Carry case and straps included. 25 Year Warranty! Power x Obj. Dia. : 10x25, Field of View: 303 ft. at 1000 yds., Eye relief: 14.1, Exit Pupil: 2.1mm, Weight: 14oz, Height: 4.25"
Power x Obj. Dia. : 8x32, Field of View: 375 ft. at 1000 yds., Eye relief: 13.8, Exit Pupil: 4mm, Weight: 20oz, Height: 4.75"
Power x Obj. Dia. : 10x32, Field of View: 303 ft. at 1000 yds., Eye relief: 13.8, Exit Pupil: 2.1mm, Weight: 23.8oz, Height: 6.4"
These superb-quality rubber-armoured glasses are tough enough to take on your wildest adventures! And we really do mean wild! 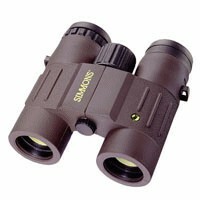 These Simmons professional glasses have been built to full military specification and have special shock-proof optics designed to withstand "extreme blows to the binocular body" (from manufacturer's product data). The moment you hold these excellent binoculars you can feel that they have been made for the ultimate "demanding user"! What these binoculars lack in elegance and grace they more than make up for in sheer thoughness and optical quality. They feature individual eyepiece focussing - the hallmark of this type of binocular - and a general-purpose reticule in the right eye (however, the reticule is fine black lines and of course these are not visible when the binocular is used on the night sky). They are fully waterproof and have been dry-nitrogen purged (fogproof). They have fully multi-coated (on all optical surfaces!) BaK4 prisms and lenses for perfect colour rendering and high contrast. The eyepieces feature fold-down eyecups, making them ideal for spectacle wearers. Includes rainguard dustcaps, soft padded case and neck strap.